March is Women’s History Month and we are is showcasing women who have contributed to the movement of women’s empowerment and equality. August 26th is considered to be National Women’s Equality Day in the U.S. as a commemoration of the passing of the 19th Amendment to the Constitution in 1920 which granted women the right to vote. In Canada, women’s suffrage was extended to federal elections on May 24th, 1918. However, both countries continued to disenfranchise women of color by prohibiting naturalization of Asian women, requiring literacy tests, and/or establishing poll taxes to bar people of color and indigenous people from voting. It was not until 1948, after the passing of the UN Universal Declaration of Human Rights, that Asian Canadian women were allowed to vote in federal elections. In 1952, immigrants of Asian descent were given the rights to become citizens and vote. However, it was not until 1965, after the passing of the Voting Rights Act, that these acts of voter disenfranchisement were deemed unconstitutional in the U.S. Still, women today are consistently underpaid compared to their male counterparts and are underrepresented in fields of STEM, politics, and business. While the fight for women’s equality is far from over, UNAVSA would like to highlight two women who have fought for the equal treatment of all disenfranchised people. 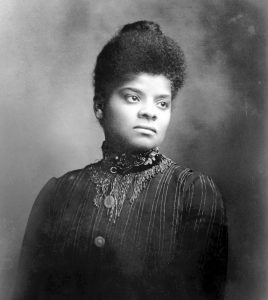 One activist we would like to highlight this month is Ida B. Wells-Barnett (1862-1931), a journalist and activist for human rights. She was best known for her contributions to organizing an anti-lynching campaign and bringing international attention to the lynching of African Americans in the 1890s. In 1896 Wells-Barnett helped found the National Association of Colored Women (NACW) to advocate for civil rights and women’s suffrage. She later organized African American women of the Alpha Suffrage Club in Chicago to march in the 1913 suffrage parade. However, African American women were asked to march in the back on the basis that Southern legislators would oppose of the parade if African American women were at the front. This eventually leads to Wells-Barnett’s open critique of the women’s suffrage organizations in the U.S. for excluding black women. Wells-Barnett served not only as an exemplar for women’s rights activists, but of an advocate for equal rights and social justice for all. Too often have strides towards equality been marred with new systems of disenfranchisement and systemic oppression. Wells-Barnett understood this well when she emerged at the front of the 1913 suffrage parade despite the segregation that was imposed on African American women during the march. She is also considered to be a founding member of the National Association of Advancement of Colored People (NAACP) though she is not officially listed as a founder. She later cut ties with the NAACP due to their lack of action-based initiatives and dedicated her work to the National Equal Rights League (NERL).